The Beverly Hills Supper Club fire in Southgate, Kentucky, is the third deadliest nightclub fire in U.S. history. It occurred on the night of May 28, 1977, during the Memorial Day holiday weekend. A total of 165 people died and more than 200 were injured as a result of the blaze. It was the deadliest fire in the United States since 1944, when 168 people were killed in the Hartford circus fire in Hartford, Connecticut. The Beverly Hills was a major attraction, less than ten miles (15 km) outside Cincinnati, just across the Ohio River in Southgate, Kentucky, on US 27, near what would later become its interchange with Interstate 471. It drew its talent from Las Vegas, Nashville, Hollywood and New York, among other places. The site had been a popular nightspot and illegal gambling house as early as 1926; Ohio native Dean Martin had been a blackjack dealer there. It had reopened under the then-current 1970s owners/management in 1971 and was considered an elegant, upscale venue that attracted both top-notch talent and top-notch clientele. Several additions had been built onto the original structure consistently through the 1970s and finished by 1976, creating a sprawling, non-linear complex of function rooms and service areas. The resulting complex was roughly square in shape, and though it was not situated in a north-south direction, reports of the fire have tended to assign those points to points in the complex for ease of reference. Assuming this system, the front entrance of the complex lay at the southern point of the compass. Along the southern wall, to the east of the building entrance, was a small event room called the Zebra Room where the fire was first discovered. At the opposite, northern end of the building lay the Garden Room, which occupied the northwestern and north-central area of the northern wall, and the Cabaret Room, which jutted out from the northeastern corner of the building. A long narrow interior corridor connected the Zebra Room to the other spaces along the eastern side of the building, terminating at the garden area, just past the Cabaret Showroom area. A number of other event and services spaces were scattered throughout the rest of the building, with some rooms leading into each other, some leading into interior hallways, and some leading to the outside of the building. A partial second story covered approximately the southern third of the building, sitting above the main entrance, Zebra Room, and main dining room; it held two more small event rooms made of six smaller rooms conjoined, collectively labeled the Crystal Rooms. Though the building's frame and ceiling tiling was classified as non-combustible, the Beverly Hills Supper Club made substantial use of wooden building materials, including floor joints for the two-story portion of the complex and framing on interior hallways. It was decorated throughout with highly-flammable carpeting and wood wall paneling; event rooms also used wooden tables and supports, as well as tablecloths, curtains, and a variety of other small combustible materials. The building did not have a fire-suppression sprinkler system installed—at the time, these were not required in venues such as the Supper Club— nor did it have an alarm system or smoke detectors. In addition, the majority of the paths of egress in each event room led not to the outside of the building, but to a variety of narrow interior corridors and service spaces. On May 28, 1977, the Beverly Hills Supper Club was operating beyond capacity, largely due to the popularity of that evening's Cabaret Room show, featuring popular Hollywood singer and actor John Davidson. Based on its number of exits, the Cabaret Room could safely accommodate around 600 people, according to the calculations of the Fire Marshal; on this night it was packed well beyond that capacity, with people seated on ramps and in aisles. According to later estimates based on seating charts and memories of those present, the number of people in the Cabaret Room at 9:00 p.m. on May 28 was somewhere between approximately 900 and approximately 1,300. No matter the exact number each gives, sources agree that the room was well beyond its safe holding capacity. Elsewhere in the club, patrons were enjoying a fine meal. Later estimates place the total number of people in the Beverly Hills Supper club on May 28, 1977 at somewhere around 3,200, substantially more than the 1,500 people fire code allowed at the time for a building with the number of exits the club had. Near the south exit close to the main bar, opposite end of the building from the Cabaret Room, a wedding reception drew to a close around 8:30 p.m. in the Zebra Room, near the building's main entrance; some of its guests had complained of the room being excessively warm with loud explosions from beneath the floor, and the group left the building before the end of their allotted time. The assigned waitress cleaned up dishes and another housekeeping staff put away a vacuum sweeper. Another waitress gathered a drink of leftover punch between 8:45 and 9:00 pm, and left without detecting a fire. The room remained vacant from their departure until a minute before 9 p.m., when an employee (receptionist) smelled smoke and opened the Zebra Room's door to confirm the presence of smoke. She asked another employee to call the Fire Department while she and others grabbed any available fire extinguishers and began trying to fight the flames. Though the employees were not aware of it, their opening of the Zebra Room's door allowed enough oxygen into the room to cause what had been a smoldering fire in the room's drop ceiling to flashover and begin to spread rapidly. It quickly became clear that fire extinguishers could not quash the fast-growing fire. The Fire Department was alerted to the fire at 9:01 p.m. and was on the scene by 9:05; as they approached, firemen on the first emergency vehicles could already see smoke coming from the building. As smoke began to escape the Zebra Room and drift down the hall toward other banquet rooms, patrons and employees in the rooms nearest to the Zebra Room smelled it. The employees began to verbally urge room occupants to leave the building; however, as the sprawling complex lacked an audible fire alarm, those in further-flung rooms had no way to know that there was a fire in the building until an employee walked the length of the building alerting them. Fire investigators later estimated that, once through the northern doors of the Zebra Room, the fire took only two to five minutes to arrive at the Cabaret room; as a result, news of the fire and the first of the smoke and flame reached the Cabaret Room, the farthest point from the Zebra Room, nearly simultaneously. By the time busboy Walter Bailey arrived in the Cabaret Room and interrupted the show to order an evacuation at 9:06 p.m., there was very little time left for the audience of around a thousand people to make their way through the room's small number of exits. As it spread laterally, the fire also began to spread upwards, engulfing the spiral staircase that would have provided the best exit for those on the second floor of the building. Around 9:10 p.m., power failed in the building, taking the lights with it. Panic ensued, and even those who had been calmly moving toward exits in the Cabaret Room began to push and shove. The situation was made worse by the fact that of the three exits in the room, two were quickly blocked off by the fire, leaving the crowd to funnel through a single exit. Employees outside the exits attempted to pull guests to safety, but the crush of bodies as those behind pushed upon those in front became so solid that no amount of strength could free most of them. Many of those who escaped the crush blocking the northeast fire exit became lost trying to find other exits. Twists and turns in building design which led to a set of doors opening into a bar area funneled some into a dead end. Firefighters, alerted that the majority of the building's occupants were in the Cabaret Room, focused their efforts there, but even the combined efforts of every fire department in the county could make little headway against the flames. Temperatures in the Cabaret Room soared into the thousands of degrees and even firefighters were soon unable to safely attempt any further rescues. At 11:30 p.m. fire command, suspecting that the building's roof would not hold much longer, ordered all firefighters out of the building. At approximately midnight, the roof gave way and collapsed onto what was left of the building. The magnitude of the blaze was so large that firefighters did not have the flames under control until around 2 o'clock that morning; parts of the building continued to burn until May 30, two days after the fire began. By the early morning of May 29, 134 bodies had been removed from the building and laid out, initially on the hillside surrounding the building and then in a makeshift morgue inside the nearby Fort Thomas Armory. By the end of June 1, twenty-eight more bodies had been discovered, bringing the death toll up to 162. All but two of the dead were found in and around the Cabaret Room, with 125 clustered near the room's north exit and another thirty-four at the room's southern exit. Two bodies were removed from the Viennese Room. A small number of fire victims died after being rescued from the scene: one on June 25, one on July 2, and the last on March 1, 1978, nearly a year after the fire. This brought the number of verified deaths to 165. Overcrowding. Although seating charts recovered from the club after the fire show that the Cabaret Room (the largest facility in the club) normally held between 614 and 756 people, a hostess who had worked at the club for several years estimated occupancy on the date in question to be well over 925. Inadequate fire exits. Full occupancy of the entire complex was estimated to be roughly 2,750, which under Kentucky law would require 27.5 exits. The club only had 16.5 exits, many of which were not clearly marked nor easily reached. Some exits could only be reached by passing through three or more interior doors and corridors. Faulty wiring. Governor Julian Carroll's report on the fire called the club's wiring an "electrician's nightmare", and alleged multiple, wide-ranging code violations. Bridgetown electrician H. James Amend, who inspected the fire site at the request of a local attorney Stan Chesley a year and a half later said, "I cannot believe that any of this was ever inspected." Lack of firewalls. This allowed the fire to spread, and in addition allowed it to draw oxygen from other areas of the complex. Poor construction practices. The club had been built piecemeal with inadequate roof support, no common ceiling space, and highly flammable components. Extreme safety code violations. There was no sprinkler system and no audible automatic fire alarm, and some doors were locked, yet those were not meant for public exit and caused no death. Poor oversight by regulatory authorities. The local volunteer fire department is said by the Enquirer to have known of the deficiencies, but by law, at the time, did not have the authority to compel corrections. On October 28, 2008, Kentucky Governor Steve Beshear appointed a panel to investigate claims that arson may have been the cause of the fire. In March 2009, the panel, in recommending that the investigation not be reopened, characterized the new accusations as "a very tiny shred of evidence of arson and a huge mountain of conjecture, unsupported speculation, and personal opinion." In a letter dated late June 2011 from Kentucky Attorney General Jack Conway to a retired Kentucky State Police trooper, some 30 boxes of color slides were taken in the days after the fire, including pictures of the club's basement during the aftermath. They were ordered to be returned to the State archives for public accessibility. The last victim of the fire, Barbara Thornhill of Delhi Township, died on March 1, 1978, nine months after the fire. Many early sources (including the Pulitzer citation below) give the death toll as 164. Richard Whitt of the Louisville Courier-Journal was awarded the 1978 Pulitzer Prize for Local General or Spot News Reporting for his articles on the fire. His citation reads: "For his coverage of a fire that took 164 lives at the Beverly Hills Supper Club at Southgate, Ky., and subsequent investigation of the lack of enforcement of state fire codes." As of 2015, the site of the club has been left undeveloped. A state historic marker commemorates the fire, though some former club employees, David Brock and Wayne Dammert especially feel that the marker is inaccurate. This was the first lawsuit to use the concept of "enterprise liability" and one of the first disaster suits to be brought as a class action. Chief litigation attorney Stanley Chesley raised millions through the class action, benefiting many survivors. 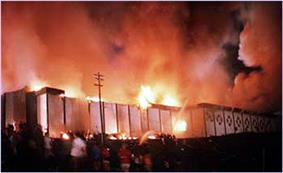 ^ Beitler, Stu (October 22, 2007) Southgate, KY Nightclub Fire Disaster, May 1977 | GenDisasters ... Genealogy in Tragedy, Disasters, Fires, Floods. .gendisasters.com. Retrieved on 2013-05-28. ^ Weintraub, Jerry and Cohen, Rich (2010) When I Stop Talking, You'll Know I'm Dead, Grand Central Publishing, ISBN 0446568937. ^ Wallace, H. Lew (1991) "Beverly Hills Nightclub" Kentucky Encyclopedia (Online Edition). University of Kentucky. ^ Flynn, Terry (May 28, 1997). "Pleasure palace was creme de la creme". The Cincinnati Enquirer. Retrieved February 8, 2015. ^ a b c d e f The Beverly Hills Supper Club: The Untold Story Behind Kentucky's Worst Tragedy, by Robert Webster. Newport, KY: Saratoga Press, 2012. 328 pages. ISBN 978-0-615-62220-0. ^ a b c d e f Bright, RIchard (September 1, 1977). "Appendix C: Richard Bright's Analysis: An analysis of the development and spread of fire from the room of fire origin (Zebra Room) to the Cabaret Room" (PDF). Beverly Hills Supper Club Fire:. Center for Fire Research, United States National Bureau of Standards. pp. 93–113. Retrieved February 4, 2015. ^ a b c d e f g h i j k l Duval, Robert F. "NFPA Case Study: Nightclub Fires" (PDF). National Fire Prevention Association. Retrieved February 4, 2015. ^ a b c d e f g h i Kenning, Chris (May 27, 2007). "Fire that claimed 165 lives is seared into memories". The Courier-Journal. Retrieved February 4, 2015. ^ a b c d e f g "How it Happened: Tragedy Routed in Code Violations". The Cincinnati Enquirer, May 25, 1997. Accessed December 6, 2009. ^ a b Clarke, Norm (June 8, 2014). "Reporter recalls 1977 Beverly Hills fire". Cincinnati.com. Retrieved February 9, 2015. ^ a b Inge, Ronald (July 7, 2014). "The Beverly Hills Supper Club fire revisited". Carolina Fire Rescue EMS Journal. Knight Communications. Retrieved February 4, 2015. 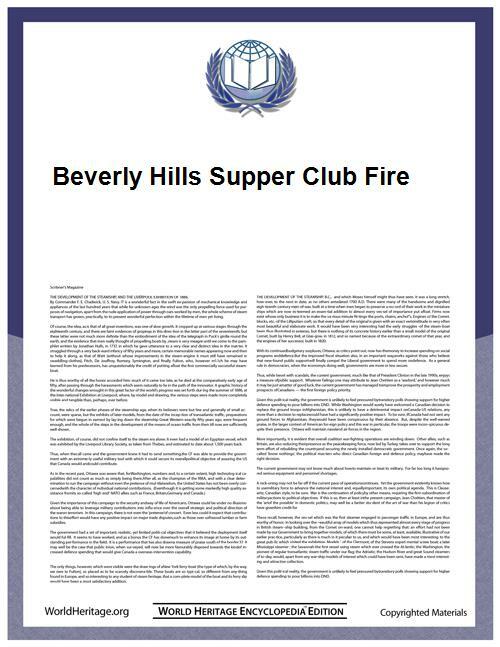 ^ "Beverly Hills Supper Club Fire". WLWT-TV official YouTube channel. Accessed December 6, 2009. ^ a b "A Chronology". The Beverly Hills fire: the fire that still rages. The Cincinnati Enquirer. May 28, 1997. Retrieved February 12, 2015. ^ Kaufman, Ben L. "The Beverly Hills Fire: Lives That Were Touched", The Cincinnati Enquirer. Accessed December 7, 2009. ^ "LESSONS LEARNED – The Beverly Hills Supper Club fire revisited". Carolina Fire Rescue EMS Journal. Retrieved 2 November 2015. 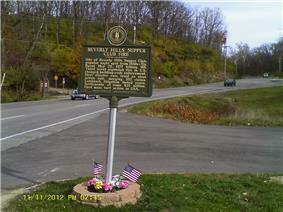 ^ Beverly Hills Supper Club Fire, Kentucky.gov, p.7. (PDF) . Retrieved on 2013-05-28. ^ Pulitzer Prizes – 1978. Accessed December 7, 2009. ^ Schroeder, Cindy (25 May 1997). "The Beverly Hills Fire: Only Memories Left on Bare Hillside.". The Beverly Hills Supper Club: The Untold Story Behind Kentucky's Worst Tragedy, by Robert Webster. Newport, KY: Saratoga Press, 2012. 328 pages. ISBN 978-0-615-62220-0. Beverly Hills: The Anatomy of a Nightclub Fire, by Robert G. Lawson. Athens, OH: Ohio University Press, 1984. 304 pages. ISBN 0-8214-0728-7. Inside the Beverly Hills Supper Club Fire, by Ronald E. Elliott and based on an original story by survivor Wayne Dammert. Paducah, KY: Turner Publishing Company, 1996. 280 pages. ISBN 1-56311-247-7. Reconstruction of a Tragedy: The Beverly Hills Supper Club Fire, Southgate, Kentucky, May 28, 1977, by Richard L. Best. Boston, MA: National Fire Protection Association, 1977. ISBN 0-87765-113-2.